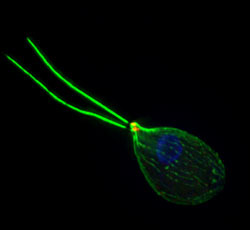 N. gruberi flagellate-stage (microtubules are highlighted in green, basal bodies in red, and DNA is stained blue). Photo by Lillian Fritz-Laylin, UC Berkeley. N. gruberi, amoeba-stage. Photo by Lillian Fritz-Laylin, UC Berkeley. Naegleria gruberi (strain NEG-M) is a widespread free-living soil and freshwater amoeboflagellate. The Naegleria gruberi genome represents the first from a member of the Heterolobosea, an environmentally important and unique basal lineage of amoebae. Many heteroloboseans, including Naegleria, are defined by a unique three-stage life cycle: amoeba, flagellate, and cyst. In culture, Naegleria will grow and divide as an amoeba. Once starved, however, Naegleria will "transform" into a flagellate, developing a microtubule cytoskeleton including flagella and basal bodies de novo. The resulting flagellate stage is transitory, and flagellates eventually return to the amoeboid stage. 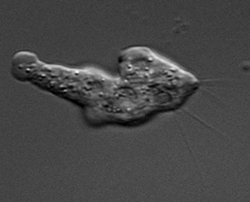 Chandler Fulton and colleagues at Brandeis University pioneered research on the amoeba-to-flagellate transformation, the cytoskeleton, and the physiology and metabolism of N. gruberi. Although N. gruberi is free-living, it does have closely-related pathogenic relatives (N. fowleri) that can cause severe amoebic meningitis. N. gruberi is not related to other amoebae with sequenced genomes such as Dictyostelium discoideum, Acanthamoeba castellani or Entamoeba histolytica. Although identified almost a century ago, the NEG-M strain of N. gruberi was isolated about 50 years ago from the Eucalyptus Grove (EG) -- outside of the current Life Sciences Addition Building at UC-Berkeley. The N. gruberi genome will be crucial for studies of cell biology, evolution and environmental microbiology in free-living amoebae. Future comparisons of N. gruberi to the genomes of parasitic or free-living relatives that exist only as amoeba (Monopylocystis), or only as flagellates (Percolomonas) could provide additional insight into the process of heterolobosean transformation. Watch the movie of N. gruberi transitioning from amoeba to flagellate.